Minimum 35-45% Triterpenes, 15-25% Madecassoside + Asiaticoside B, and 15-20% Asiaticoside. As a dietary supplement, take 120mg of Gotu Kola Extract powder 2-3 times daily. 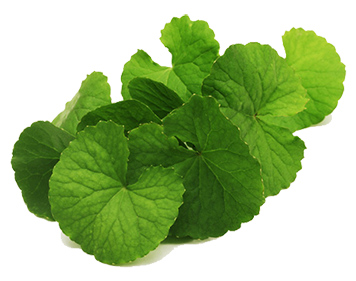 Gotu Kola, scientific name Centella asiatica and sometimes referred to as Asiatic Pennywort, Indian Pennywort and Tsubokusa; is a perennial plant native to India, China, Japan, Indonesia, Sri Lanka, South Africa and the South Pacific. As an aquatic plant, it grows abundantly in tropical, swampy areas and is known for its fan-shaped green leaves and white, purple or pink flowers. Traditionally, both the leaves and stems of the Centella asiatica plant are used to obtain its reported health benefits. Gotu Kola’s history of use, as well as its nootropic benefits, are very similar to that of Bacopa monnieri – even to the extent that they have even shared common names such as Brahmi. Due to its similar name, Gotu Kola has also been often confused for the Kola Nut as well. However, it should be noted that, unlike Kola Nuts, it is not stimulating nor does it contain any caffeine whatsoever. Much the opposite, in fact, as Gotu Kola has been reported to actually promote relaxation. In China, it has often been referred to as “the fountain of life” and is renowned in traditional Ayurveda as a memory supplement among its other benefits and uses. The active chemicals in Gotu Kola are known as triterpenoids. Some studies conducted on triterpenoids suggest they may benefit memory function, promote healthy stress levels as well as increase the strength and volume of collagen. Much like Bacopa monnieri, it is reported that it may take a few weeks for Gotu Kola’s cognitive-enhancing benefits to take a noticeable effect. It is believed this is due to Gotu Kola activating a class of proteins known as mitogen-activated protein kinases (MAPKs), which then in turn causes a release in a growth factor for neurons called brain-derived neurotrophic factor (BDNF). This may support neuronal growth which promotes brain plasticity and communication between brain cells. In 1992, a study of rats concluded a positive effect on memory function when they were supplemented with a Gotu Kola extract daily for fourteen days. Learned-behavior retention was then measured to be 3 to 60 times better in those rats than that of the control animals in the same study. Other studies indicate that an additional Gotu Kola benefit may be its ability to support the brain from neurotoxins such as a lead, arsenic and aluminum. Is This Gotu Kola Extract Standardized For Its Triterpene Content? Yes, this Gotu Kola Extract is standardized to a minimum 35-45% Triterpenes, 15-25% Madecassoside + Asiaticoside B, and 15-20% Asiaticoside. To learn more, read the Gotu Kola reviews and experiences below. Nootropics Depot offers 15 gram or 30 gram jars of high quality Gotu Kola Extract Powder. Nootropics Depot's Gotu Kola Extract Powder (Centella asiatica) has been lab-tested and verified for both product purity and identity. I have not used this product yet but I have some on the way. I am thrilled that ND has started carrying as I have used Gotu Kola herb in capsules before during a Phenibut taper and it is an extremely useful tool to have in your Phenibut kit. At higher doses it is supposed to raise Gaba levels in the brain and is theorized to have GABA-B binding affinity. I have used a range of 5-10 grams of the raw herb in capsules and found it equivalent to around 500-1000 mg of Phenibut and is able to mask quite a bit of the withdrawal symptoms as well. ND Admin: We do not recommend intranasal administration for any of our products.